August 16th in Premium Themes, Themes for Real Estate Pros by Wordpress Jedi . If you have been involved in the real estate business as an agent or a broker, you probably understand how the Internet has changed the way things are done in that business. There are lots of innovative web services that let home buyers and sellers come together and get their deals done more quickly. And now thanks to the power of WordPress, you can build your very own real estate website in under 20 minutes. All you have to do is plan what you want to display on your site, and what theme you want to use on it. 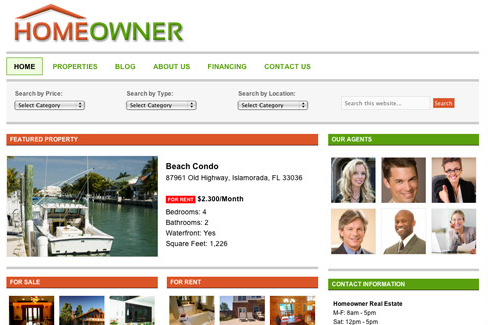 Home Owner is a cool theme that works for both agents and brokers. 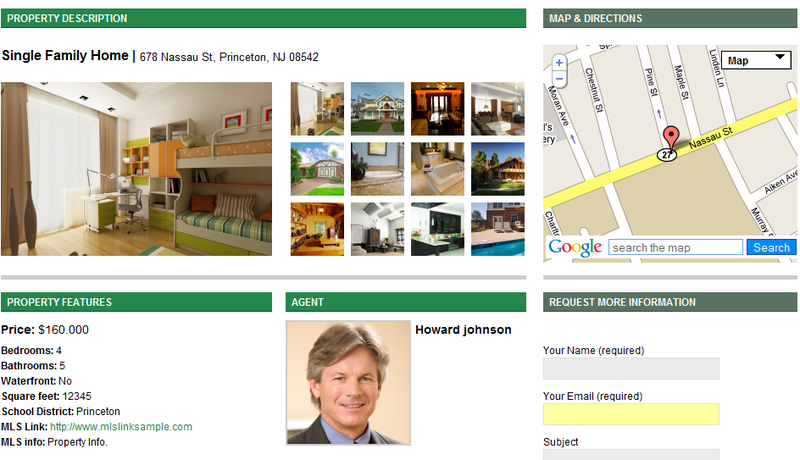 It’s a premium theme designed specifically for active real estate professionals who want to list and sell houses fast. Many real estate agents have these tiny one page websites, and they expect to make sales and grab leads, but you need a professional looking website if you want to make it big as a real estate agent. Home Owner is a cool real estate for WordPress that lets you do just that. Home Owner is a clean, well-designed theme that lets you add your houses and images to your website fast. It also supports multiple agents, so if your real estate firm has more than one agent, you can easily add them to your sidebar. There are a lot of other things to love about Home Owner. For starters, you get various color styles to choose from. So you are not stock with only one setting. Another impressive feature about this theme is the built in filtering system that lets you visitors filter through your houses and find the one that they like the best. Your visitors can filter through your results by price, location, or property type. You got to love the featured image section on the home page as well. This theme makes it so easy to add your properties in a matter that is attractive and easy to use for your visitors. You’ve got to appreciate all the plugins and scripts that are used to make Home Owner stand as it is. You can easily manage a real estate agency with this theme. Your agents will only have access to their own listings, so they won’t be able to edit their colleagues’ property information. And who can forget about the integrated Google map service that makes it so easy for your customers to find the house of their dreams on a map. All in all, Home Owner is another great WordPress theme for Realtors that helps you build an online presence for your business or your agency fast. It’s very well designed and comes with a lots of powerful features to take your game to the next level. If you have multiple agents in your business or just want to list your houses more effectively, Home Owner is worth a look.